Welcome to our Website, where you can electronically order and purchase our offered Goods. The Website is online system (platform) of order and purchase-sale of Goods, which is administered by Uzdaroji akcine bendrove "TORVELA", legal entity code 124738436, VAT payer’s code LT247384314, registered office address at Smilgu str. 8, Palanga, the Republic of Lithuania. These Instructions of Use of Website and other documents of the Rules are applicable and mandatory for you and all others existing and potential Customers and Visitors. In order to ensure protection of your rights and legitimate interests, also in order to help you feel as safety and confident as possible while using the Website and ordering the Goods from the Seller’s electronic store, we kindly ask you to read the Instructions of Use of Website and all other documents of the Rules, that is down below. Please note that in order to use the Website and platform of order and purchase-sale of the Goods available therein, you have not only to read the Rules down below, but also agree with its content, as well as to comply with the Rules. While using the Website and (or) registering an Account, you declare and approve that you carefully read all documents of the Rules, including these Instructions of Use of Website, understood its content, also without any exceptions, agree with all conditions provided in the Rules and undertake to comply with them. If you disagree with the Rules, you cannot use the Website. 1.1.22. Consumer – the Customer, who is a natural person and has entered into the contract for consumption purposes, i. e. purposes not related to his business, trade, craft or profession. 2.1. These Instructions of Use of Website is integral and inseparable part of the Rules and establishes terms and conditions of use of the Website, as well as the rights and obligations of you and the Seller related to the use of the Website, including application of the documents of the Rules, conditions of registration of the Account, the activities, which are forbidden on the Website and etc. 2.2. The Instructions of Use of Website applies to all documents of the Rules, regardless of whether this is clearly indicated in such documents of the Rules, unless otherwise is stated in the relevant document of the Rules. 2.3. The references into the sections, clauses, parts, provisions, also the conditions given in these Instructions of Use of Website or in the specific document of the Rules, are references to the sections, clauses, parts, provisions, also the conditions of the documents in which such reference were made, unless otherwise is stated. Every time, when words like „engaging“ or „including“ or the words having the similar meaning are used, it is considered that after them the words „without restrictions“ are used. 2.4. The definitions, which are written in the capital letter and are not defined in these Instructions of Use of Website, are defined in the other documents of the Rules or in the other requirements and (or) instructions, which are available on the Website. You may access these Rules, also save it and print it at any time by using the address of the Website: [http://amberbytorvela.com/terms-of-use]. 3.2. If there are discrepancies between the information, obligations, requirements or instructions provided on the Website and the documents of the Rules indicated above, the provisions of the documents of the Rules mentioned above shall be applied, unless otherwise is specified in the other documents of the Rules. 3.3. The specific document of the Rules shall enter into force from the moment specified therein. The reference into the Rules or any other document of the Rules, means the reference into the valid version of the Rules or any other document of the Rules, unless otherwise is specified. 3.4. We kindly ask you to read the Rules before using the Website. Any person, in particular the Consumer, before becoming the Buyer or the Customer should well evaluate the provisions and requirements of the Rules, also his abilities to comply with them, including whether each provision and requirement of the Rules are individually acceptable. Also, the Consumers, in particular, are recommended to evaluate and analyze whether the Rules of Purchase-Sale of Goods, the Seller’s guarantees and approvals for the quality, suitability, use, purpose of the Goods, limitation of our liability, our right to unilaterally correct, modify or annul any of the documents of the Rules and (or) the Website, its content, which are provided in the Rules. If you disagree to all and (or) any (only one) condition and (or) requirement of any document of the Rules, you (especially if you are the Consumer) may not use the Website, become the Customer, Buyer or purchase the Goods by concluding the Contract. The Seller does not promote Consumers to become Buyers, for this reason, the Consumers, who decides to become the Buyers, becomes Buyers exclusively acting on their own initiative and assume risk related thereto, including the risk of the application of the provisions of the Rules. 3.5. Any use of the Website, including the accession on the Website, staying logged in in the Website, using the Website, collection of the data and information from the Website means that you agree with all the provisions of the Rules, unless otherwise is specified in the other documents of the Rules. If you did not registered the Account on the Website and disagree to any condition and (or) requirement of any document of the Rules, you have to stop using the Website immediately (despite your termination of the use of the Website, the provisions and conditions of the Rules apply furthermore to those legal relationship that occurred till the termination of the use of the Website, also to legal relationships, which arise from mentioned above, even if them came after the termination of the use of the Website). 3.6. The Seller has the right from time to time, at his discretion, to correct (including to change, edit, supplement, annul, and delete) the Rules or any part of them and (or) any information related to the Rules, without the prior warning. The Customer, who has the Account, can access to any amendments, corrections or supplements of the Rules on the Website and, if the Customer want to shop on the Website, it will be necessary to accept the modified Rules. The Rules valid at the time of the using of the Website or while ordering the Goods will apply to the Buyer, who submits the Order of Goods, or to the Visitor, who uses the Website. If you disagree with the specific amendments of the Rules, you have the right to terminate use of the Website, including the annulment of your Account, as it specified in Section 4 of the Instructions of Use of Website. If you do not annul your Account within 7 (seven) days after the amendments of the Rules and continue using the Website and (or) your Account (including purchase the Goods), it will be considered that you agree to relevant amendments of the Rules. Your Orders of Goods submitted prior coming into force of the new Rules and (or) conditions of the Rules, will be executed according to the version of the Rules, which was valid and with which you agreed on the day of your Order of Goods. 3.7. 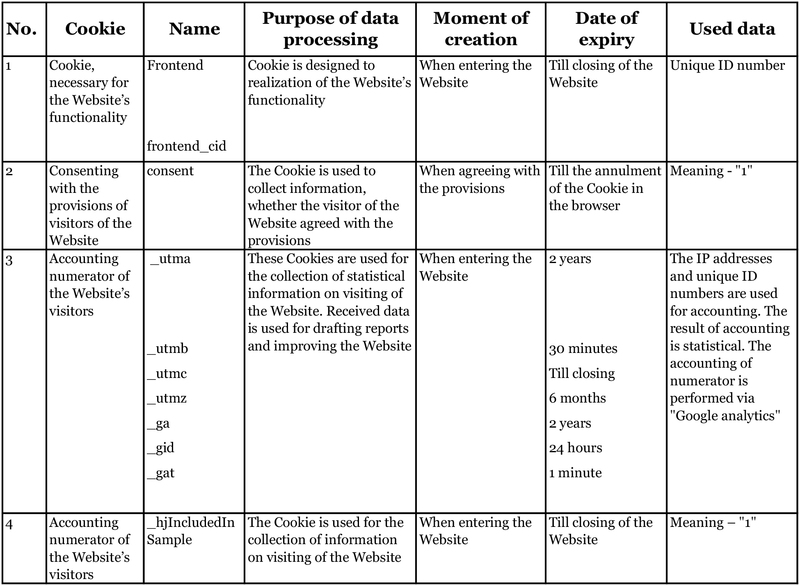 Creating an Account (how it is defined in Section 4 of the Instructions of Use of Website) and every submission of the Order of Goods (how it is defined in the Rules of Purchase-Sale of Goods) requires your confirmation that you read, agree and undertake to comply with the Rules, including these Instructions of Use of Website. Your consent has to be made by noting it in the specific input of the Website "I confirm that I have read the Rules and agree to them" (or analogue reference, which states your will), i. e. the actions have to be made through the "check-box" window. 4.1. Any Customer can submit the Order of Goods on the Website, i. e. either the one, who registered (created) the Account, or the one, who did not register the Account (as the Guest). 4.2.4. In the form of registration of the Account (it is applicable also when submitting the Order of Goods as a Guest), you submitted your Personal Data, also stated your will on its processing and storage according to the Rules and other applicable legal acts. Your consent is made by noting it in the specific input of the Website, i. e. through the "check-box" window, as indicated in Clause 3.7 of the Instructions of Use of Website. We want to notice that by creating the Account and submitting the Orders of Goods later, you confirm that all conditions, which are defined in Clause 4.2 of the Use of the Website, are fulfilled and you are wholly responsible for performance of them. 4.4. When you properly and fully make the registration procedure of the Account on the Website, you will be informed about that by notice from the Seller, sent by the e-mail address submitted by you at the time of registration. 4.5. After you finish the registration of the Account, you can use the settings and opportunities accessible on the Website, also you can change and (or) supplement your Personal Data later. You have to manage, handle and use your Account in other ways only according to the Instructions of Use of Website, other Rules, requirements and (or) instructions. 4.6. In order to log in to your Account, you should use your e-mail address submitted at the time of registration of the Account and the password (the symbols that can identify and check the identity of the Client on the Website). In case the e-mail address submitted at the time of the registration of the Account changed, was deleted or its validation time ended, you must notice the Seller about it. 4.7. The Website’s services on the Account is unlimited in time, but the Customer has the right, at his discretion, to annul his Account without any reasons, except the cases when the Contract is being performed. If the Contract is being performed, the Account may be annulled at the time, when all Buyer’s obligations under the Contract are performed. The annulment of the Account does not release the parties of the Contract from performance of their obligations’, which arose till the annulment of the Account. If you want to annul (delete) your Account from the Website, you have to do it in accordance to the instructions specified on the Website and (or) to contact the Seller by using the contacts specified in Section 12 of the Instructions of Use of Website. 4.8. The Account is yours and you may not transfer it to the third party without permission of the Seller. You also may not give the right to the third parties to log in to your Account using your data of the accession, except the cases where the Seller gives a clear permission. In any case, the Seller is not responsible for that you gave your data of accession to the third parties, also for the damage that occurs, when the third parties use your Account illegally. 4.10. You are responsible for all information submitted in your Account, including the Personal Data, its accuracy, also for all operations that are done while using your e-mail address and password, except the cases where information about your log in data was revealed to the third parties without your fault. For that purpose you must to protect your log in data, keep them confidential and do not reveal them to the third parties, also you are obligated to do not make the conditions and make every effort to protect your log in data from the disclosure to any unauthorized third parties, that those parties could not use your Account to get services of the Website and (or) order (and) acquire the Goods from the Seller. The Customer must immediately inform the Seller about any loss of the log in data or impermissible use of his log in data or the Account. If the Seller is not informed in the order specified in this Clause, it will be considered that log in data and, consequently, the Account are used by the Customer. 4.11. The Seller has a right at any time to warn you or to stop, restrict or annul your access to the Account temporary and (or) for unlimited period, if you made the infringement as specified in Section 5 of the Instructions of Use of Website or you do not log in and (or) do not use your Account for the last 2 (two) years. 5.1.9. violate any provisions of the Rules. 5.2. You agree that any violations specified in Clause 5.1 of the Instructions of Use of Website gives the right to the Seller to warn you, restrict, stop or annul your access to the Account, to restrict, forbid your actions on the Website through your Account, including the opportunity to purchase the Goods, and the Seller at any time may take technical and (or) legal actions to restrict your access to the Website without prejudice to other measures that the Seller could take. 5.3. You agree that the Seller has a right to unilaterally decide for the application of the Point 5.2 of the Use of the Website or any part of it. You also undertake to take any resolution of the Seller, which is related thereto. In this case you have to stop using the Website through your Account, other Account, also you may not register the new Account, if the Seller did not give the separate consent to perform relevant actions. Also, for the violation of the Rules or third parties rights, you may prosecuted in accordance with the legal acts and the additional liability and sanctions may be applied to you. 6.1. The Seller does not check any information submitted and specified on the Website by you, the Seller also does not perform the verification of your identity and data, except if otherwise is specified in the other documents of the Rules or other instructions provided for on the Website. Further, the Seller does not control and guarantee any Customer’s or Visitor’s capacity or person’s authorizations to act on behalf of the legal entity. 6.2. We use the reasonable physical, electronical and procedural measures and methods in order to protect the information we have from loss, theft or any unauthorized use, disclosure or alteration, and similar actions. We want to notice that apart from that fact, the Seller not guarantee and may not guarantee the security of your Personal Data, because it is submitted and collected through the internet. You can reduce the risk of the illegal use of the Personal Data, if you act prudently and choose the smart security measures, for example, you choose the difficult password, use the newest antivirus software and etc. 6.3. Even though the Seller uses specific measures to protect the content of the Website, the Seller does not guarantee that in the Website and (or) in the downloaded files there are no viruses. Taking into account that, we advise you to use the additional measures to protect from the viruses. 6.4. The Seller or providers of the Third Parties’ Services are not responsible in any form for you or third parties for any indirect or random losses, any loss of income, reduction of the business opportunities or company’s reputation, loss of business or earnings (direct or indirect), any claim, damage and losses that occurred due to your actions performed on the Website or related thereto. 7.1. The Seller makes all the effort to ensure the appropriate functionality of the Website, also seeks the Website to function continuously and without failures "as it is now" or "as it is available" at the moment of the creation of the Rules and provides the Customers / Buyers / Visitors access to it without any explicit or implicit guarantees and confirmations, including guarantees and confirmations in relation to the accuracy of the Website, its appropriateness to use for certain purpose, name, inviolability and etc. You understand and agree that technically is impossible to ensure the constant totally (100 %) availability of the Website. Despite of that, the Seller will seek to keep the Website available as it possible, however shall not have the right to submit claims or requirements to the Seller for the availability of the Website and refuse the relevant claims in advance, if you would have such or such would occur. In any case, if you will see the inappropriate Website’s activity or interference, you have to inform the Seller about it. 7.2. The Seller has the right wholly or partly, temporary or permanently, restrict the access to the Website, also without the prior warning, at his discretion, change, modify, edit, delete, annul or not to renew any part of the Website or Website’s activities. 7.3. You can submit all observations and (or) complaints related to the Website’s activity by using the Seller’s contacts specified in Clause 12 of the Instructions of Use of Website. You have to specify your name, surname, e-mail address, also to describe inappropriate activity of the Website, mistake, failure or etc. and, if it is possible, the date (time) and duration in your approaching. 8.1. The Seller or, when it is expressly stated, the third parties retain the Intellectual Property Rights to the Website, domain and its content to the maximum permitted capacity of the legal acts, which are applicable to the Rules. All specific rights are retained all over the world. You cannot in any way to change, copy, recreate, repeatedly public, upload, submit, send, sell, create the derivative works, in any way to use or distribute the Website, its content (including the document of the Rules), including the text, graphics, code and (or) software or any other content, unless the Seller gave his written permission to perform such actions or these actions are expressly allowed in the specific conditions specified in the Rules. Despite of that, you can print and (or) download separate pages of the Website exclusively for your personal, non-commercial use, with the condition that you do not change or delete any warnings about the Intellectual Property Rights from that material. 8.2. You declare and agree that the Seller is the owner of all Intellectual Property Rights that are on the Website and the domain or the Seller has the lawful and legitimate right to use the Intellectual Property Rights, also that except the cases when it is directly specified in the Rules, you do not get any Intellectual Property Rights on the Website and (or) to the Website. 8.3. All marks of the Goods and services available on the Website, are the Seller’s property or the Seller uses it legally (including marks of the Goods and services that are offered for sale). Any rights to use these marks of the Goods and (or) services (including trademarks) are not given by the Rules. 8.4. The content of the Website can be quoted in case the prior written consent of the Seller is received and the source of the quoted content is properly indicated. 9.1. If you do not inform us in writing otherwise or in the separate document of the Rules is not indicated otherwise, we will contact you by submitting the notices through the Website and (or) by sending it to your e‑mail address. You agree to get our electronic notices and agree that these electronic notices are safe and eligible for the requirements applicable under the legal acts for the form of the written notices. It is considered that you got the notice when the Seller provided it into the Website (if it is possible) and (or) send it to your e-mail address submitted on the Account or Order of Goods. 9.2. All notices are addressed to the Seller and having legal effect related to the conditions of the Instructions of Use of Website and (or) Rules, have to be in written form and delivered to us personally or while using such a delivery measures, which allow to submit the proof about the receiving, using Seller's contacts specified in Clause 12 of the Instructions of Use of Website. Notices sent to the Seller on your behalf shall come into force from the moment they are received. 10.1. If imperative provisions of the law of the Republic of Lithuania, including imperative provisions of the law of the European Union, does not require otherwise, for the Rules and separate documents of the Rules, legal relationship arising from or related thereto, the law of the Republic of Lithuania shall be applicable (including the questions related to the conclusion, validity, invalidity, execution, termination and withdrawal) and the Rules are interpreted according to the law of the Republic of Lithuania, the integral part of which is the law of the European Union. 10.2. Every dispute, disagreement or claim, which arises from the Rules or is related to the Rules, its violation, termination, withdrawal or validity, shall be settles in a way of negotiations. If the agreement cannot be reached by the negotiations, the dispute shall be settled under procedure specified in the law of the Republic of Lithuania in courts of the Republic of Lithuania, except the case, when in the separate document of the Rules or in the provisions of imperative applicable legal acts is specified otherwise. 10.3. In addition to your rights related to dispute resolution specified in Clause 10.2 of the Instructions of Use of Website, your claims related to the Goods that you bought on the Website, if you are the Consumer, can be settled out-of-court. Your claims related to the Good that your bought on the Website, can be submitted to the State Consumer Rights Protection Authority, according to the order of dispute resolution specified and applicable by the authority, or can submitted to other specific institutions by using website of electronic settlement of dispute, which is available at https://webgate.ec.europa.eu/odr/main. 11.1. The Seller has the right, at his discretion, at any time to introduce and (or) withdraw proposals, sales or change the prices of the Goods that are announced on the Website or any material or content of the Website, without prejudice to rights of the Buyer, including conditions of the Contract, that are made till that change. 11.2. The matter not discussed in these Instructions of Use of Website and (or) any other document of the Rules, are settled in accordance with the provisions of the applicable legal acts. 11.3. If any provision of the document of the Rules is contrary to legal acts, or after change of the legal acts the provision became contradictory, or for any other reasons is invalid, it does not invalidate the remaining provisions of the relevant document of the Rules. In this case, the Seller immediately changes it with the legally binding provision that is similar to the invalid provision and comply to the purpose of the relevant document of the Rules. 11.4. You have no right to transfer your rights and obligations that occur from the Rules and (or) are related to the Rules to the third parties without the prior written and explicitly expressed consent of the Seller. The Seller has the right to transfer any rights and obligations without you additional consent to any person, according to the documents of the Rules. In such case of transfer, the provisions of the documents of the Rules will be binding to the successor, providing at least the same guarantees and (or) rights that are granted to you in accordance with the documents of the Rules. 11.5. The Seller is not responsible for any and all your costs, including the internet’s or any other fees or payments for the service providers and (or) other third parties, that you experienced due to the use of the Website and (or) the conclusion of the Contract through the Website. If you need any help or you have any questions and (or) claims on interpretation of the Rules an (or) its application, we kindly ask you to contact the Seller by using the following contact and we will answer to all your enquiries as soon as possible (if you are the Consumer – no later than within 14 (fourteen) calendar days) by using the contacts specified by you under the procedure specified in Clause 9 of the Instructions of Use of Website. Welcome to our electronic store (the Website), which is administered in the Republic of Lithuania by the Uzdaroji akcine bendrove „TORVELA“ , legal entity code 124738436, VAT payer’s code LT247384314, registered office address at Smilgiu str. 8, Palanga, the Republic of Lithuania (the Seller). In our Website you can purchase the original Amber by Torvela jewelry, which are made from amber and other Goods. We seek that your time spent while shopping on this Website would be a pleasant experience, so we offer you to familiarize with the Rules of Purchase-Sale of Goods on the Website before buying. 1.1. These Rules of Purchase-Sale of Goods becomes the binding legal document to the Seller and the Buyer, after the Buyer, who wishes to purchase the Goods, agrees to it. This document is a an integral and inseparable part of the Rules of the Website, which lays down the rights and obligations of the Seller and the Buyer, the conditions and procedure of purchase and payment of the Goods, the conditions and procedure of delivery and return of the Goods, the liability of the parties and the other provisions, which are related to the purchase-sale of Goods on the Website. 1.2. The Buyer’s consent with the Rules of Purchase-Sale of the Goods is expressed by agreeing with the Rules of the Website, including the Rules of Purchase-Sale of Goods, and approving such consent during each purchase of the Goods by ticking check-box with the confirmation that “I have read and agree with the Rules of the Website” (or the similar text confirming your will). Reference to the Rules available on the Website are given next to the confirmation. 1.3. The Seller gives an opportunity to Buyers to choose and order (by submitting the Order of Goods), also to conclude the Contract on purchase of the Goods on the Website, which is available 7 (seven) days per week. 1.4. The sale on the Website takes place and the Goods are delivered worldwide. 1.5. To buy the Goods on the Website can persons, who are specified in Clause 4.2.1. of the Instructions of Use of Website, who agree to comply with the conditions, which are specified in Clauses 4.2.3. and 4.2.4. of the Instructions of Use of Website. By submitting the Order of Goods, you confirm that you are the person, who has the right to buy the Goods on the Website according to the requirements of the Rules (including, when it is applicable, you have authorizations to act on behalf of the legal entity) and that all conditions, which are specified in this point, are satisfied, and you are fully responsible for its implementation. 1.6. All Contracts of purchase of the Goods on the Website are concluded in English language. Essential conditions of the Contract and information about the Ordered Goods are submitted to the Buyer (1) at the time of submission of the Order of the Goods on the Website; and (or) (2) together with an automatically generated electronic notification of the Seller on submission of the Order of Goods, which is sent to the Buyer to their indicated e-mail address after submission of the Order of Goods; and (or) (3) if the Buyer wishes, they are submitted in other durable medium by adding them together with the Invoice to shipment of Goods. 1.7. The Rules of Purchase-Sale of Goods are made in accordance with the provisions of the Civil Code, the Law on Consumer Protection, the Rules of Retail Trade and other applicable legal acts, which are valid in the Republic of Lithuania during the preparation of the Rules of Purchase-Sale of Goods. 1.8. Definitions and expressions, which are written in capital letter in these Rules of Purchase-Sale of Goods, shall have the same meaning as it have in the Instructions of Use of Website, unless otherwise is specified in these Rules of Purchase-Sale of Goods. 2.1. Any Client can submit the Order of Goods on the Website, i. e. either the one, who has registered (created) the Account, or the one, who did not register the Account (with rights of the Guest), but submitted the Personal Data in confirmation form of the Order of Goods. 2.2. In all cases, the Buyer has to read the valid Rules of the Website and express their consent with them before confirming the Order of Goods in accordance with the procedure specified in this Section of the Rules of Purchase-Sale of Goods. The Buyer confirms their acquaintance and consent with the documents of the Rules in the way and conditions, which are specified in the Instructions of Use of Website. The Order of Goods can be submitted and received for the Seller’s processing only if the Buyer is acquainted and consents with the Rules. In any other cases, when the Buyer disagrees with the Rules or particular part of it, they has no right to order the Goods on the Website. By submitting the Order of Goods and expressing the acquaintance and consent with the Rules of the Website, the Customer unconditionally confirms that he has the right to buy Goods on the Website and to conclude the Contract on the purchase thereof. 2.3.2. after formation of the cart of Goods, i. e. after choosing of all preferred to buy Goods that are offered on the Website, to go to the Website’s icon with the mark of the cart of the Goods and (or) the link “Cart” and click, accordingly, on the icon “See cart” or "Check out". After clicking " See cart " or " Check out ", the Client will be redirected to another Website’s page, where they be able to view their choices (the data of the Order of Goods) and after entering the data, which is requested on the Website, to confirm/submit the Order of Goods, or immediately enter the data, which is requested on the Website, and confirm/submit the Order for the Goods. 2.4. The Order of Goods, which is placed on behalf of the Customer (Buyer), must be confirmed by the Customer by clicking Website’s link "Place order and pay" (or an equivalent link expressing Customer's will) before processing of it. Up to this moment the Buyer has a right to change the Order of Goods by changing selected Goods and (or) the data of Goods, data of method of delivery and payment of Goods. 2.5. After the Customer performs the actions specified in Clause 2.3 of the Rules of Purchase-Sale of Goods and confirms the Order of the Goods in order specified in Clause 2.4 of the Rules of Purchase-Sale of Goods, the will of the Customer to conclude the Contract on purchase of Goods with the Seller is expressed in accordance with the provisions of the Rules. 2.6.4. method of delivery of the Goods and address. 2.7. In order to confirm the receipt of the Order of Goods, which is submitted by the Buyer, the Seller to the e-mail address that is provided by the Buyer sends the automatically generated e-mail, in which all essential data of the Order of Goods is provided. 2.8. The Seller, after receive of the Order of Goods, which is submitted for processing by you, immediately checks, whether the Goods, which are specified in the Order of Goods (according its nature, quantity and etc. ), are in the Seller’s warehouse. If the Seller cannot supply all or part of the Goods that are ordered to the Customer (the Buyer) under the procedure indicated in these Rules of Purchase-Sale of Goods or Rules, the Customer will be informed about the corresponding status of the Order of Goods and will be able to make decision about its execution (partial execution or withdrawal of the whole Order of Good (annulment)). In any case, the Seller has a right to contact you within 3 (three) working days after the submission of your confirmed Order of Goods (Clause 2.7 of this Section), to contact you regarding circumstances of execution of your submitted Order of Goods or to annul the order, including due to circumstances specified further in Clause 2.9 (in all cases, the Seller will make all efforts to inform the Customer as soon as possible about the status of the Order of Goods). 2.9.3. The Seller will reasonably recognizes that the Buyer attempts to fraud, while submitting the Order of Goods; the fraud is any Buyer‘s action related to submission and proceeding of the Order of Goods, which violates applicable legal acts, such as: violation of the security of the Website (platform), use of the Website not according to its purpose, use of the username (e-mail address) and password (i. e. not your own) of the other Buyer or impeachment of another person and etc. 2.10. The Seller is not responsible for the damage, which is caused by the unauthorized use of the Account by the third parties. In case any other person logs in to the Account by breach of the Rules and submits the Order of Goods using the Account, and the Buyer did not notify the Seller in accordance with provisions of the Rules, it will be considered that the Buyer orders and (or) purchases such Goods. 3.1. The presentation of the Goods on the Website does not create any obligations to the Seller. The Contract on the purchase-sale of the Goods between the Buyer and the Seller shall be deemed as concluded from the moment, when the Buyer receives the automatically generated Seller's e-mail, which contains all essential data of the Order of Goods (or equivalent message), which is specified in Clause 2.5 of these Rules of Purchase-Sale of Goods, and is valid until full performance of obligations under this Contract. The possibility of the Buyer, who is the Consumer, to withdraw the Contract is discussed in Section 7 of these Rules of Purchase-Sale of Goods. 3.2. After the Buyer familiarizes with the Rules, agrees and obliges to comply with the Rules, the Buyer confirms that he does not object that the Rules would not be presented to them in writing (paper form), unless the parties of the Contract agrees otherwise. In all cases, if the Buyer wants to view, save and (or) print the Rules of the Purchase-Sale of the Goods, the Buyer can download the Rules from the Website or contact the Seller with the specific request by using the Seller’s contacts specified in Section 9 of the Rules of Purchase-Sale of Goods. 3.3. Together with the Order of Goods that is submitted by the Buyer on the Website, these Rules of Purchase-Sale of Goods and the other Rules, become the Contract between the Buyer and the Seller, which is the binding legal document for both parties of the Contract. 4.1. The prices of the Goods on the Website and in the Order of Goods are indicated near specific Goods in the official currency of the Republic of Lithuania in accordance with the requirements of the legal acts of the Republic of Lithuania. The final price of the Goods with taxes, including VAT (if applicable), and shipping costs, is indicated after inserting Goods into the cart of the Goods and after entering into the cart of the Goods. 4.2. The Seller's Website indicates the final price of the Goods, which is valid for the delivery of such Goods in the territory of the European Union. Therefore, if the Goods are delivered outside the territory of the European Union, the Buyer will be responsible for the payment of taxes, which are related to the Goods, including, but not limited to any import, duty, VAT and other taxes, if applicable. 4.3. Discounts, which are applied to the Goods by the Seller, shall not be cumulated, unless otherwise is specified by the specific rules of the discounts or sales and is clearly stated and published on the Website and (or) in the any other document of the Rules. 4.4.1. in the way of the payment for the Goods in advance (i. e. till the delivery and transfer of the Goods to the Buyer) (1) by bank transfer (e-banking) or (2) using an electronic payment service system Paypal. We want to draw your attention to the fact that in such case the specific rules of use of website and rules on processing of personal data indicated in the website, into which you are directed, may be applied. Therefore, we recommend you to familiarize with such rules before making the payment. We note that the Seller is not liable for the compliance of these website’s rules to the requirements of the legal acts. 4.5. After the Customer chooses to pay for the Goods in advance by bank transfer or through the electronic payment service system, the Customer obliges to pay for the ordered Goods immediately. The Goods will be started to prepare for the delivery and the deadline of the dispatch of the Goods, which is specified Clause 5.4 of these Rules of Purchase-Sale of Goods (i. e., the execution of the Order of Goods will start) will start only after the Seller receives the confirmation that your payment has been made. If the price of the Goods cannot be deducted from the Buyer's bank account for any reason (for example, the details of the payment were indicated incorrectly, etc.) within 7 (seven) working days from the date of submission of the Order of Goods on the Website (Section 2 of these Rules of Purchase-Sale of Goods) and the Buyer fails to fulfill the obligation to pay for the Goods, it will be deemed that the Buyer withdraws the Contract and the Seller has no obligations to the Buyer arising from the Contract. 4.6. In each case when the Buyer purchases the Goods, an Invoice will be presented to the Buyer along with the Goods. We want to draw your attention to the fact that if the Buyer is a VAT payer, Buyer's VAT payer’s code must also be indicated to the Seller. 4.7. The Seller has the right to change the prices of the Goods, which are specified on the Website, after the submission of Buyer’s order in case it is related to technical information system errors on the Website. When the price is changed by the Seller according to the circumstances specified above, the Seller informs the Buyer immediately and coordinates the further execution of the Order of Goods. If the Buyer disagrees to the change of the price of the Goods, the Buyer‘s order is annulled, and in case the Buyer has already paid for the Goods, the price and (or) the costs of the delivery of the Goods will be returned to the Buyer. 4.8. In case the Client wants to get more units of certain Goods than it is available on the Website and by using the Website submits a request to the Seller, the submission of the Order of Goods, specific terms of the execution and payment of the Order of Goods shall be coordinated under separate agreement between the Buyer and the Seller. 5.1. The Goods can be delivered to the Buyer worldwide. 5.2. Under Buyer’s choice the ordered Goods can be transferred to the Buyer by delivering the Goods to the address, which is specified by the Buyer, or to the nearest post office through the delivery services’ provider chosen by the Seller (courier services "TNT" or postal services provider "Lietuvos paštas" (“Lithuanian Post”) (in this case, the Goods are sent by the registered mail). The Goods are usually delivered within 3-4 working days after dispatch day, using the TNT services, and within 7-14 working days after dispatch day, using "Lietuvos paštas" services. The Seller seeks to ensure the high-quality, accurate and prompt delivery of the Goods, however, the Buyer understands that the delivery of the Goods can be late without the Seller’s fault. In all cases, the Seller is exempted from the liability for violation of the delivery terms, if the Goods are not delivered or delivered to the Buyer not complying with the terms, which are specified in these Rules of Purchase-Sale of Goods, not on the Seller's fault or due to circumstances beyond the Seller's control. 5.3. The fee for the delivery of the Goods (if applicable and (or) applicable depending on the chosen method of the delivery of the Goods) is clearly indicated on the Website at the moment of the submission of the Order of Goods. 5.4. Unless otherwise specified in the Website and (or) agreed between the Seller and the Buyer, the Goods are prepared for dispatch to the Buyer within 3-7 working days from the date of the occurrence of the circumstances specified in Clause 4.5 of these Rules of Purchase-Sale of Goods. The Buyer agrees that in the exceptional cases preparation of the Goods for dispatch may be delayed and the execution of the Order of Goods may take longer. In such case the Seller obligates to contact the Buyer immediately and agree with the Buyer on the other term of the delivery of the Goods or to annul the Order of Goods, if the Buyer desires so. In any case, when the Buyer is the Consumer, the Seller undertakes to deliver the Good to the Buyer not later than within 30 (thirty) days from the date of conclusion of the Contract. 5.5. In all cases the Seller is exempted from the liability for the violation of the term of the delivery of the Goods, if the Goods are not delivered to the Buyer in time because of the fault of the Buyer or due to circumstances beyond the Seller's control. 5.6. If the Goods are delivered to the Buyer, the Buyer obligates to accept the Goods personally. In that case, when the Buyer is unreachable at the address, which is specified in the Order of Goods, the person authorized by the Seller, who provides the Goods’ delivery services, has a right to transfer the Goods to any other adult, who has the proper capacity and submits the document confirming the payment for the Goods or other document confirming conclusion of the Contract or the right to accept the delivered items. In this case, the Buyer will not have the right to submit any claims to the Seller regarding delivery of the Goods to not authorized person. 5.7. It is deemed that the Goods are properly delivered to the Buyer, when the document confirming the delivery of the Goods, which is presented by the third party, who provides the delivery service, is signed (for example, a delivery note, invoice, etc.). 5.8. The Buyer confirms his acknowledgment with the fact that after the signing of the document confirming the transfer (delivery) of the Goods, the risk of accidental loss and (or) damage to the Goods passes to the Buyer. 5.9. The quantity of the Goods and their packaging has to be checked at the time of the delivery of the Goods to the Buyer. If after the transfer of the Goods the Buyer determines that the quantity and (or) assortment and (or) assembly of the Goods is not correct, the Buyer must to inform the Seller immediately about these violations. The Buyer must to inform the Seller in writing about apparent defects of the quality of the Goods (broken packaging, quantity mismatches, apparent defects of the Goods, etc.) immediately, but not later than within 1 (one) day from the date of the transfer of the Goods (otherwise, after this term the Buyer will not have the right to submit any claims to the Seller regarding apparent defects of the transferred Goods and it will be deemed that the Seller transferred to the Buyer the Goods of a proper quality). In such cases Clause 6.1 of these Rules of Purchase-Sale of Goods applies. The defects of the Goods arising due to the Seller's fault in accordance with this Clause of the Rules of Purchase-Sale of Goods shall be eliminated in accordance with the procedure and terms agreed between the Seller and the Buyer. 5.10. The Seller undertakes to return paid money to the Buyer within 14 (fourteen) days from the date of the Order of the Goods, if the Seller is not able to deliver the Goods ordered by the Buyer (and if it is not possible to offer similar or as similar as possible Goods with the consent of the Buyer) due to the important circumstances specified in these Rules of Purchase-Sale of Goods. 6.1. If there is no warranty of quality for the certain type of Goods given by the producer, such Goods will be subject to the warranty of quality of Goods for 24 months (twenty four months) that is provided for by the applicable legal acts. 6.2.4. unilaterally terminate the Contract, return the Goods and demand restoration of the price, when the sale of the Goods of the improper quantity is the essential breach of the Contract. 6.3. The Buyer understands that the color, form and (or) other parameters of the Goods, which are displayed on the Website, may not correspond to the actual specifications of the Goods’ forms, color and (or) other parameters due to the technical features of the device used by the Buyer. Therefore, in case you require more detailed information, advice or instructions regarding our Goods, please contact the Seller directly by using the contacts specified in Section 9 of these Rules of Purchase-Sale of Goods. 6.4. The defects of the sold Goods are eliminated, the Goods of the improper quality are changed and returned in accordance with the applicable legal acts and the order specified in these Rules of Purchase-Sale of Goods. 6.5.5. Goods’ purchase document must be provided. 6.6. The Seller has a right to refuse to accept returning Goods, if the Buyer does not comply with the procedure and conditions of the returning of the Good specified in this Clause. 6.7. The Buyer is responsible for the reduction of the value of the Good due to the actions / factors / circumstances that are not indispensable for the determination of the nature, characteristics, complexity and (or) operation of the Goods. 6.8. When the Goods of the improper quality are returned to the Seller, the costs of the returning of the Goods are reimbursed to the Buyer by the Seller. 6.9. If the Goods with defects are returned, it shall be returned by sending them to the Seller (using the services of the delivery service provider) to the Seller's address, which is specified in Section 9 of these Rules of Purchase-Sale of Goods (with the description "Returning of the Goods with defects"). You must return the Goods together with the document, which confirms the receipt of the Goods, which was received during the delivery of the Goods, and description of the defects, as well as your request (you can use the model form for withdrawal from the contract (by indicating the information about the defects of the Good)). 7.1. For Buyers, who are Consumers, defects of the sold Goods are eliminated, the Goods of improper quality or proper quality are replaced, returned and (or) the Contract are withdrawn in accordance with the applicable legal acts and in the order specified in these Rules of Purchase-Sale of Goods, taking into account specific rules specified in this Section of the Rules of Purchase-Sale of Goods applicable to Consumers. 7.2. The Buyer, who is the Consumer, has the right, without any reasons, to withdraw from the Contract by informing the Seller in writing about this not later than within 14 (fourteen) calendar days from the day of the transfer (delivery) of the Goods. In such case, when the Contract covers and is concluded for the purchase of several Goods that are delivered to the Consumer separately, the right to withdraw from the Contract shall expire after 14 (fourteen) calendar days from the day, on which the last Good according to the Contract was transferred (delivered). In order to withdraw from the Contract, the Consumer shall submit a free form request on return of the Goods to the Seller by using the contacts specified in Section 9 of these Rules of Purchase-Sale of Goods (the Consumer may also use a model form for withdrawal from the contract, which is added to these Rules of Purchase-Sale of Goods as Annex 1 (use of this form is optional)) and add the document confirming the purchase of the Goods from the Seller. 7.3. In case the Buyer under the procedure specified in this Section submits request on return of the Goods to the Seller, the Buyer, who is the Consumer, has to return the Goods (if they have already been transferred to the Buyer) to the Seller at Buyer’s own expenses not later than within 14 (fourteen) calendar days from the day the Seller submits the corresponding request, by sending it (using the services of the delivery service provider) to the Seller's address specified in the Section 9 of these Rules of Purchase-Sale of Goods. 7.4. The Seller must return all payments received from the Buyer, which is the Consumer, including the price of the delivery of the Goods, if it has been applied (except for the additional costs, which arose due to Buyer’s selection of the other than the usual cheapest method of delivery offered on the Website), immediately, but in any case not later than within 14 (fourteen) days from the day of receipt of the Buyer’s request on withdrawal from the Contract. The Seller returns paid money to the Buyer to the Buyer's bank account, from which the payment for the Goods was made, unless the Buyer agrees with another Seller's offer. We want to draw your attention to the fact that the Seller may not return the Buyer’s paid money (the price of the Goods and (or) costs of delivery) until the Goods are returned to the Seller or until the Consumer provides a proof that the Goods were sent to the Seller. 7.5. When the Consumer returns or replaces the Goods in accordance with the cases specified in Clauses 7.2-7.4 and 7.6 of these rules, the requirements specified in Clause 6.5 of the Rules of Purchase-Sale of Goods, applies. 7.6. The Buyer, who is the Consumer, has a right within 14 (fourteen) calendar days from the day of the receipt of the Goods, to replace the Goods by the analogy, but of the other dimensions, shape, color, pattern or completeness of the Goods. If the difference of the price is created during the change of the Goods, the Buyer must settle with the Seller, according to the recalculated prices of the Goods. The Buyer's request to change the Goods is satisfied, if all the conditions provided in Clause 7.5 of these Rules of Purchase-Sale of Goods, are satisfied. In order to use this right, the Buyer must deliver the Goods to the Seller in the method, that is specified in Clause 7.3 of these Rules of Purchase-Sale of Goods and submit the original documents of the purchase of the Goods. 7.7. If the Seller does not have the proper Goods for the replacement, he informs the Buyer and the Buyer has the right within 14 (fourteen) calendar days from the day of the specific notice of the Seller, return the Goods to the Seller. In this case, the provisions of the replacement of the Goods of the proper quality applies. 7.8. If the Good is returned in accordance with the order specified in Clauses 7.2-7.4 of these Rules of Purchase-Sale of Goods or replaced by the other Goods, as specified in Clause 7.6 of Rules of Purchase-Sale of Goods, the Buyer is responsible for all costs of the return of the Goods. 7.9. We want to draw your attention to the fact that, if the Goods purchased on the basis of the Contract, are attributed and (or) recognized as pearls, precious stones, precious metals and their products in accordance with applicable legal acts, the request of the Buyer, who is the Consumer, to replace the purchased Goods of the proper quality by analogue Goods or return paid money, can be satisfied only with the consent of the Seller for the reasons specified in Article 6.362 of the Civil Code of the Republic of Lithuania. 8.2. None of the parties of this Contract shall be liable for nonperformance of its obligations, improper performance of its obligations or delay to perform them, if such occurs due to force majeure circumstances, which are determined in accordance with the applicable law. Execution of the obligations of the parties is prolonged for the duration of the circumstances that are mentioned above. 8.3. Matters, which are related to the purchase of the Goods on the Website and use of the Website, which are not regulated in these Rules of Purchase-Sale of Goods, are regulated in the Instructions of Use of Website and other documents of the Rules. 1.1.1. Personal Data – any information about you, as a natural person, whose identity has been identified or can be identified; the natural person, whose identity can be identified, is the person, whose identity can be identified directly (using an identifier such as name and surname, internet identifier) or indirectly (according to one or more physical, physiological, genetic, psychological, economic, cultural or social identity features). 1.1.2. Cookie – small file, which is sent into your browser and stored in your computer, mobile phone or other device, which you are using to connect to the Website. 3.1. The Website creates an opportunity to use it anonymously, i. e. to use it in the way that only Anonymous Information would be collected about you through the Website’s tools. You can use the Website anonymously until you decide otherwise or until you decide to perform the actions, which requires to disclosure your Personal Data (for example, to create an Account or to connect to your Account, to place the Order of Goods and etc.). 4.3.3. to ensure an access to the services and information on the Website, also for the other purposes, which are indicated in the specific case, when the information is collected. 4.5. The Seller stores the actual data about your purchases of the Goods. When you are the Customer and have the Account, you can receive all information about Orders of Goods submitted to the Seller, after you login to your Account. By using the tools installed in your Account, you can view your Orders of Goods and change your Personal Data. You must keep safe your Account’s access data and not disclose it to the third parties. 5.2. In any case, you cannot refuse to receive administrative information, which is related to the purchase of the Goods, Services provided by the Seller or the Website (including the Rules) from the Seller. Also, you may not refuse to receive messages from the Seller, which provide the legal information related to purchase of the Goods and (or) use of the Website. 6.1. The Seller has a right to disclosure your Personal Data when it is required by the applicable legal acts, also in the context of implementing legal and reasonable, i. e. complying the requirements of the legal acts, Seller‘s policies and rules, e. g., while responding to received complaints or other complaints, when third parties rights and legitimate interests are violated, or in order to protect other persons, their legitimate interests or property. 6.3.3. to the other business subjects, in case the Seller merges with the other legal entity, the Seller acquires the other legal entity or the other legal entity acquires the Seller, also in cases where the Website or assets related to the Website would be transferred. 7.1. While registering (the Customer), i. e. opening (creating) the Account on the Website, or acquiring the Goods as a Guest, you will be asked to submit your Personal Data. 7.2. When you become the Customer and create the Account, you can log in to your Account and independently manage your Personal Data, which is submitted in the registration form (to change and update). 7.4. If you disclosure your password or any other information about your Account to the other persons, you will be liable for all and any actions performed while using your Account. We note that in case you are connecting to the Website while using the shared or public computer, some information about you may be visible for other persons, who will use the computer after you. If you use the computer jointly with other persons, you have to log out, when you finish using your Account. It is necessary even then, when you leave the computer just for a moment. In such a way you will be ensured that the other persons would not see, use or change your information or data. 8.1. The Seller, first of all, seeks to ensure the his Visitor‘s, Customer‘s and (or) Buyer‘s data security. To ensure the security of transferred information and data, the Seller implements technical and organizational measures, corresponding the threats of security of services’ provision. The Seller uses reasonable physical, electronic and procedural measures and methods in order to protect the information from loss, theft or any unauthorized use, disclosure or alteration. 8.2. All the connections related to Buyer’s performed payment for the Goods, when selected by the Buyer, will be conducted by establishing a secure connection with the website of third party. 8.3. We want to draw you attention that despite the fact that the Seller uses appropriate above indicated measures, the Seller may not guarantee and not guarantee security of your Personal Data, because it is submitted and collected via internet. Also, the measures implemented by the Seller may be insufficient, if you do not comply with the security rules. First of all, the Customers must do not disclosure their Account access data to the third parties. Please note that the Website will ask you to submit your e-mail and password just when you try to log in to your Account. In order to prevent unauthorized persons from access to your Account, please disconnect from your Account and (or) Website after using it. 8.4. By your actions you can also reduce the risk of unauthorized access to Personal Data, if you act with caution and choose smart security measures, such as choosing a complex password, using the latest anti-virus software, etc. 9.1.2. for collection of statistical Website data (including Website’s traffic calculation) and development of the Website. 9.3. You can block the use of the Cookies and remove cookies at any time by using your browser software. For more information on how to manage the Cookies in your browser, see the "Help" tab on the internet browser's menu. However, we want draw your attention to the fact, that in this case you may not be able to fully use all the features of the Website, because blocking or deleting the Cookies may affect some of the features of the Website. 9.5. We want to notice that the Seller’s partners or third parties, who are not controlled by the Seller, also can use the Cookies. For actions of these persons the Seller cannot be and is not liable. If you suspect that without your permission the Seller’s partners or the third parties, who are not controlled by the Seller, are using the Cookies, you have to contact the specific Seller’s partners or third parties. 10.2. The Seller does not control privacy policies and (or) other rules that are applied to you by the third parties. Therefore, you, at your own discretion and risk, are liable and obligated to comply with them in those cases, when it is applied to you. The Seller is not liable for other Websites’ privacy policies or any other content, when reference to the other Websites are given on the Website, or the reference to the Website is given on other websites. Those websites may have their own privacy policies, with which you are recommended to get acquainted. When you are pressing the reference, logo or any other element of the Website, or when using the services available in the Website, we notice that at the time, when you press any mentioned element, you may leave the Website.